Does Apple still need to set a cellular data limit for over-the-air downloads? In the days leading up to Apple’s Wednesday iPad announcement, developers were just a little bit nervous over the rumored Retina display. Crisp graphics should normally be something to celebrate, but, as pointed out by The Next Web, Apple’s 20MB over-the-air cellular download limit would suffocate universal apps needing to incorporate Retina-quality graphics. 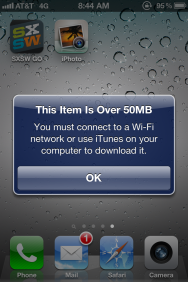 On Wednesday, Apple quietly raised this limit to 50MB, giving developers added wiggle room for such maneuvers. But even so, these limits put app-makers in a tight spot. While few are likely to choose 3G or LTE over W-Fi when installing an iPad app, the same is not true for iPhone users, who often grab programs on the go. Universal apps, which bundle graphics assets for both the iPhone and iPad into a single package, will be hardest hit. Last week, The Next Web’s Matthew Panzarino spoke with the developer of Consume, a stat tracker app, who reported that adding Retina graphics would balloon his app to almost twice its size, from 18.3MB to 35MB. If we assume other apps follow a similar scale, that would put a Twitter program like Tweetbot up around 32MB; most games I own would be lucky to come under 100MB. The 50MB limit is more reasonable than 20MB, for sure. But at this point, it seems odd that Apple still caps data in this way. It made sense to set an initial 10MB cap when the App Store first launched in 2008: Everyone on AT&T had unlimited data plans, and the cellular service’s 3G network was still relatively new with large gaps in coverage areas. Apple waited a year and a half before expanding the cap to 20MB in February of 2010; by then, users had run up against limits not only when it came to getting apps, but when wanting to download to a podcast or a music video from the iTunes Store. The move may also have been in part a preemptive Retina graphics strike, as the iPhone 4 was released later that year. 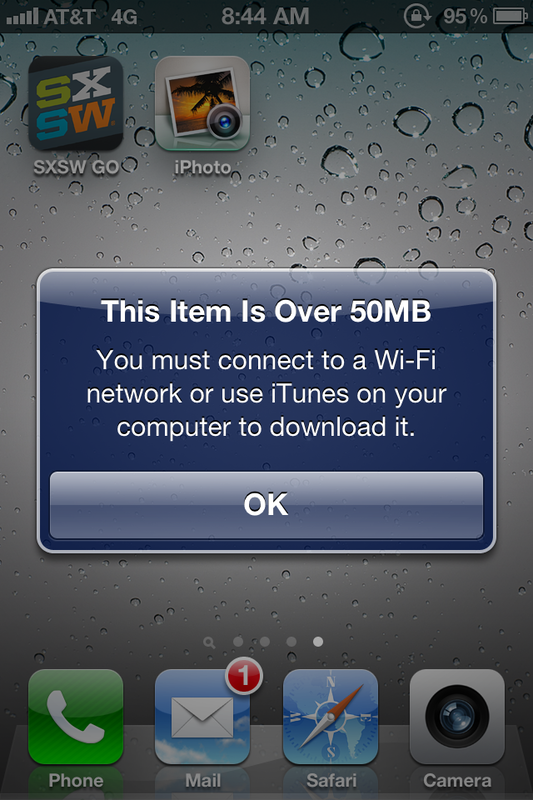 Even 50MB is too low a limit for downloading some iOS apps over a cellular connection. But with Apple’s focus increasingly on an untethered, cloud-driven product line, does it make sense to set a hard cap for data? A cap doesn’t seem to be in place to appease the cellular carriers: Aside from Sprint, no provider offers unlimited plans, and some throttle those who download too much. You’d think carriers would rather the limit be lifted—more data consumed, more data sold. Those who brush up against the high end of their data plans are quickly warned, and unlike other overages in the industry, cellular data plans are fairly easy to upgrade. I can understand the company wanting to protect its users from overage charges, or worrying that its cellular providers might seize up. Apple aims to provide the best user experience possible, and angry customers or a slow store could hinder that. But it’s been nearly four years (and 25 billion downloads): There are other protections in place. If it doesn’t adversely affect the larger user experience, those of us willing to pay for 4GB of data should be able to spend that downloading an 150MB game over-the-air if we so choose. Apple on Wednesday took the wraps off its new iPad, the third iteration of its iOS tablet. Which accessories work with the new iPad?